Run solely by volunteers, Dachshund Rescue is comprised of “a bunch of people who love doxies enough to forgo sleep to make sure they find good homes”. This loving group rescues doxies from heartrending situations: some are located in local shelters where they have lived lonely existences for months; others are found wandering the streets suffering from the struggle to survive on their own; and still others, due to the economic downturn, are surrendered by families who no longer can afford to provide the care they need and deserve. The first step taken by Dachshund Rescue is locating caring foster homes for their doxies, where they will recover from their individual traumas before their eventual adoption by forever families. Every Dachshund fostered receives veterinary care, needed medications, a bed, a blanket, a collar and leash, courtesy of Dachshund Rescue – as they say, every doxie deserves these necessities at the very least. The foster families are responsible for food and non-material support, including “love, hugs, kisses, belly rubs, patience, understanding and more love.” Foster families play a pivotial role in matching rescued doxies with their forever families. The volunteers at Dachshund Rescue make up a no-nonsense collective of caring individuals, rejecting the need for plush offices or highly paid executives. In fact, they make sure every single dollar raised goes to rescuing and rehabilitating doxies. Dr. Jane and the rest of our foundation’s Board of Directors were very moved by this compassionate, down-to-earth group of people and what they have been able to accomplish with limited resources (but an abundance of heart). If you wish to send additional support to our foundation, you may do so when placing an order online or by sending a personal check to The Dr. Jane’s HealthyPetNet Foundation, Inc. at P.O. Box 1425, Palm City, FL 34991. 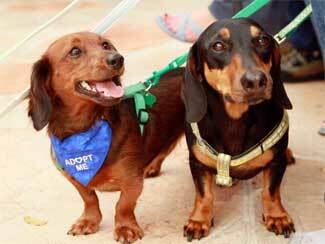 Even if you can only spare a dollar or two, you’ll be providing much-needed aid to the organizations just like Dachshund Rescue South Florida who work every day to reverse the trend of abandonment in America.